Preparing Kolkata Style Biryani is not so easy. Lots of hard work and concentration need to make such delicious one. However, after 2 years of long trying, I finally make the recipe in the original style of Kolkata. 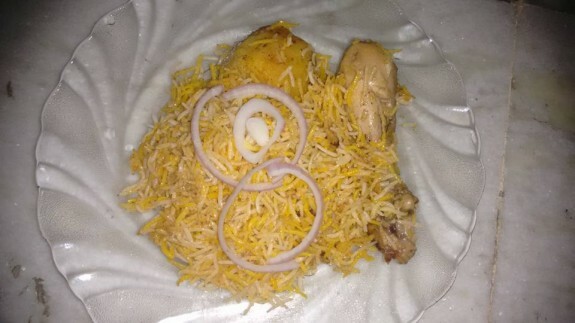 I share my experience and the art of Kolkata Style Chicken Biryani which you can serve plain or have this with Kosha Murgir Mangsho. Actually Biryani Spice is the soul of the recipe. The fragrance aroma of Biryani comes with this. 1. Roast all the whole spice in a tawa until a good aroma release from them. 2. Switch off the flame and let them cool little so that you can make a powder from this. 3. In a mixer, coarse ground the spices to make fine powder. You can keep the powder in an airtight container for future use. 1. Wash the rice in running water and then immerse them into the water at least for half an hour. This will get rid of the excess starch and give you non-sticky rice. 2. Take 4-5 cups of water in a pan and bring it to boil. Add pinch of salt, some green cardamom, 1 clove and a little cinnamon stick. 3. When water starts boil, add rice and cook for few minutes till it done. Drain the water and keep the rice under running water. Take a flat plate and spread the rice so that they will not stick to each other. 1. Cut 5 onions into slice and fry them in 2 Tbsp of oil. Add little sugar while frying to them caramelizes. Keep it aside. 2. We need 1:3 ratios of ginger and garlic. Blend the ginger and garlic in a bender to make smooth paste. Keep aside. 3. Take a small bowl and add 2 Tbsp of warm milk. Add pinch of saffron stands and keep it aside to get the colour on the milk. 4. Wash the chicken leg pieces and pat them dry with towel. 5. Now, heat 2 Tbsp of oil in a pan and lightly sauté the chicken pieces until the pieces become golden brown. 6. Now, add half of the fried onions, ginger garlic paste, curd, 1 Tbsp Biryani Mashla, 1 tsp Keora water, 2 tsp rose water and salt. 7. Mix everything well. Simmer the heat and cook it for atleast 15-20 mins. Check it in between and stir it and if required add little water. 8. When chicken will complete, switch off the flame and keep the chicken aside. We will use chicken pieces and gravy separately. 1. Take 2 potatoes and cut each of them into four pieces. Lightly boiled the potatoes with salt. 2. Heat oil in another pan and fry the boiled potatoes till they become lightly golden in colour. Turn off the heat. 1. Take a heavy bottom pan. Put Chicken leg pieces and potatoes in the bottom and top this with 2 Tbsp of chicken gravy, pinch of biryani mashlas and some fried onions. 2. Now add a layer of rice on top. Top it with 1 Tbsp gravy, fried onions, pinch of biryani mashlas, 1tsp of saffron milk. Put another layer of rice and again top it with the same as above. Do the same process of rice and spice layer again and again. At the last layer of rice, top with fried onions, pinch of biryani spice, saffron milk and finish with dollop of ghee. 3. Cover the pan with a fitting lid. Pit it on low flame and cook it for min 10 mins. Turn of the heat after 10 mins and let it keep as it is for 5 mins. 4. Now, your Biryani is ready to serve hot.